Real People in Virtual Worlds, and Virtual People in Real Worlds are the business of Virtual World Studio. Our actors and webstars boldly go where common sense tells us it was not possible, until now. A movie set is never quite a real environment, simply real enough to suspend our disbelief in the story being told..
Today's Virtual Worlds, however, are far more than the movie sets of the 20th century. For one thing, they are completely digital, located inside a computer and made to look like a real person is immersed in them. Unless, of course, you are an avatar, an artifical person who can only 'live' in these virtual evironments. But we are getting ahead of ourselves..regarding the worlds, everything in worlds can have "behaviors." The walls can have ears, the paintings can have eyecams, doors can open as you approach them, greeter beings can take you on a cybertour, the possibilities are practically infinite. From a thespian perspective, actors controlling their avatars can be located anywhere in the physical universe that has an internet connection; realtime plays can be performed with all actors at home. Yet the experience of the viewer is one of unity and continuity..It appears as if everyone is in the same place, working together...and in a very real sense, they are! Virtual cyberspace is a new kind of place unlike any other, allowing personal creativity to flourish side by side with group participation. Now back to the avatars for a moment. Most of you can see how real actors can perform in a virtual set or world, with the use of such tools as digital blue screen. But can an artifical person perform in a real space? YES! One approach is to reverse the blue screen concept, bringing an avatar into a scene that has been videotaped. 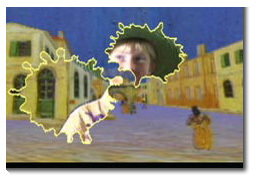 Another is to use computer/video projectors to beam an avatar onto a screen or specially prepared surface in the real world. Either way, final results can be stunning. At the Virtual World Studio we have experimented with all these approaches and combinations thereof. What works best? Depends on the project. Sometimes there is no subsitute for a real place, or an avatar in a cyberland. The biggest breakthrough of late have been the realism of the avatars. We have been working lately with the Haptek Artificial People, who look so alive, it's almost scary. Photorealism, lip synchronization, mood programability, facial expressions, fashion accessories, hair styles, wigs, etc., etc..Amazing possibilities, with no need for time consuming rendering. Actors can control the avatars in realtime. With this technology and virtual worlds, it will be possible to create feature length animated productions, like Toy Story, in record time at very modest budgets..3D televison plays can be produced for even less. Plus new distribution for finished media productions are being forged via the Internet and direct marketing of DVDs. At Virtual World Studio, we are always exploring what is possible today with avatars and virtual world technologies. If you have a media project you think may benefit from our knowledge and expertise in wielding these new tools, give us call. We'll be happy to give you feedback and set you up with a working plan.